I often try to prepare my lunch the night before a work day. Just as often I squirm out of it, saying I'll do it in the morning, I'm too tired, it's a hassle, there's no delicious black olives, etc etc. But when I actually bother, I find myself becoming giddy with a tiny degree of excitement. 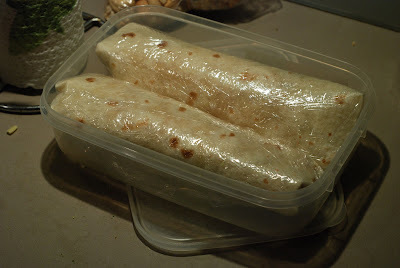 It starts with the tortilla wraps, which I subbed in for bread some years ago and never looked back. Then some light honey mustard dressing, a few slices of honey leg ham, tasty cheese, green capsicum, mixed salad leaves, and delicious, delicious black olives. I think it's healthy. I hope it's healthy. Because, the thing is, it's virtually the only lunch I make. And even though I know how it will taste, I still get excited by the prospect. By the time I'm wrapping them up in clingfilm, I'm almost disappointed that it will be a sleep and a morning's labour before I can get stuck into those bad boys. It's not much, but it's mine. ALL MINE. And I wonder - is it wrong to have some foods that are a comforting, pleasurable routine? An island of familiarity in what can so often be a day of confusion? It's not that I'm fussy. Well, not so much anymore. I must admit to not inheriting the spirited enjoyment of food experimentation that seems to characterise my paternal line. My grandmother has eaten - and enjoyed - monkey brains, and my father's obsession with those little jars of horror known as "rollmops" is legendary. Pickled herrings? On your toast? What could be nicer? I always ate a reasonably wide variety of foods, because my parents, particularly that father I just mentioned, cooked well and often. But with some aspects of food, I seemed to form habits. As a girl, I ate the same sandwiches for around 10 years. White bread, butter, and a slice of thick ham. Every day. The idea of putting lettuce and cheese on my sandwiches only occurred to me when I was around 15 years old. I ate lettuce and cheese in other combinations; but for some reason, the concept of a "sandwich", as dreamt of in my philosophy, was white bread, butter and a slice of thick ham. Oh, and the crusts cut off. Of course. But the adding of delicious fillers was a real light bulb moment. Then, a few sandwiches later, I added some mayonnaise, and it was like a heavenly choir sounding a triumphant "Aaaaahh!". STUFF GOES ON STUFF. And it is does not have to be scary. So while I am more adventurous in trying things, I still have staples that I fall back on. One of my favourite restaurants in Brisbane, The Continental Cafe in New Farm, always has the most beautiful-sounding dishes on its menu. And yet, I have only ever had the soy lime chicken breast with bok choy and coconut risotto. Why? Because I don't go there often. I can't afford to go every week and try a new thing. So when I go, I choose the dish I had the first time I went there and completely fell in love with (try it yourself, and you'll understand). Trying food that turns out to be delicious is one of life's great pleasures. But is it wrong to love the predictable, the known quantity? Surely a good wrap deserves a good rap? It's definitely not wrong to love your favorites. Predictable provides comfort and that's not bad at all. Plus you don't risk disappointment. I am a big fan of trying new things though. If you get something new, and don't love it as much, you know you can always go back to your staple the next day. But if you do find something new you like you can be two times as excited for prospects =) Then again, you'll be faced with the dreaded, now you have to make a choice of favorites. Oh the trials. "...there's no delicious black olives..." I couldn't agree more. I think that's the first time two healthy tortillas have been described as "Bad Boys". I never remember what I order from restaurants and tend to make selections like a fly landing on different dishes. I flit from one to another in no precise order waiting for my body to scream "THAT ONE"! "...there's no delicious black olives..." I'd suspect shenanigans in the night. Its even more challanging with kids, you by definition have to try a variety becuase everything you've experienced and liked is new to them. But find something they will eat and is passibly good for them and you are tempted to stick with it, as long as you can. May I suggest drained pickled jalepenoes to add bite to your wraps. My son the_weapon has begun to eat wraps for lunch and its been an evolving process; how many meats to put on, sliced cheese vs cream cheese, what topping will make the pita bread too wet by lunch time. I think I am up to wrap 4.2 in design terms. I alternated between whitebreadbutterandvegemite and whitebreadbutterandtuna sandwiches for pretty much my entire school life. For one brief shining period I paid my friend to get her dad to make me sandwiches, because he understood that "stuff goes on stuff". When he found out that the extra sandwiches weren't actually for her he put a stop to it though, and it was back to good ol' vegemite for me. I think I've been scarred by the experience, because I buy my lunch every day... Oh wait, I just realised I have vegemite on toast pretty much every morning for breakfast. I guess old habits die hard! I love wraps but I can rarely have them, or white bread, for alas, I have a reaction to gluten. It was a sad day. I now have wholemeal bread, but I'm counting on the fact it's a tad healthier than white bread. I know the feeling. And it always comes to me as a pleasant surprise seeing how I'm very un-adventurous with food. I'm NOT picky, I just like to stick to what I'm used to. But finding out that a certain food is superbly yummy makes me giddy. It's like my first time trying bubble tea. Ah, such joy! I've been eating the same work lunch for the last 6 years. I make my salad the night before work (usually when I cook) and then I enjoy it every day. I look forward to my salad, it contains all things that i like, i change it a bit every now and then, but it is always salad and I always love it. Experimenting is great, but not at lunch time at work!